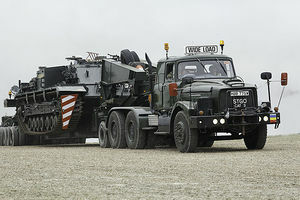 Desarrollado desde 1949 hasta 1952, este tanque intentaba enfrentarse a los nuevos tanques pesados soviéticos. Un total de 185 vehículos se produjeron en serie desde 1955 hasta 1959. A potent continuation of the support tank class of heavy British tanks, the Conqueror plays like an overcharged version of the Caernarvon, featuring a significant jump in firing speed and some small improvements to general characteristics. It is unfortunately burdened, however, by having not only the Caernarvon's sub-par hull, but also a second turret that is worse in almost all regards than the Centurion turret it first mounts. Like the Centurions, it is also highly prone to ammo rack damage. However that would appear to simply be the price one has to pay for playing one of the best and most surely damaging support tanks in the game. 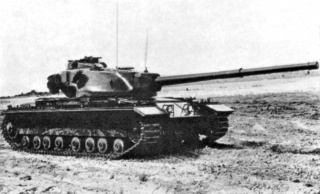 The most surprising aspect of this tank is the introduction to HESH shells on its top gun, a nasty surprise for poorly armored tanks, which is basically a High Penetration HE shell which can obliterate any tank in a few shots but it can be costly, and the shell does not benefit from Normalization meaning that its effects can be neutralized if it hits even the tiniest spaced armor. The Conqueror can be a fearsome tank once fully upgraded and is a significant improvement over its predecessor. The top L1A1 gun does a respectable amount of damage and the high ROF means that you will often get a second shot in before your enemy has a chance to reload. The decent damage and penetration on the L1A1 will allow you to engage Tier X tanks in high tier matches and still be very effective. It has the same penetration and alpha as the top gun on the M103, but is improved in terms of aiming time, accuracy and rate of fire. The armour however is weak, and even if you angle your tank, it is unlikely to bounce many shots and is very vulnerable to artillery. While not particularly fast, it is agile enough with the top engine, and so you should use this and your high ROF to deal damage then get back to cover quickly. As top tier it is more than capable of leading the push if it needs to, but assuming a supporting role for a more heavily armoured teammate and moving with a wave will allow you to put down the high DPM whilst protecting your weak hull. The ammo rack is also prone to being damaged, and wet ammo rack is practically a must. On balance, the Conqueror is a good tank and in the right hands is more than capable of turning the tide of battle or facing any of its tier 9 counterparts. The L1A1 gun is its strongest asset, and will not fail to reward those drivers who can protect the tank's weaknesses. If you can afford to buy the Enhanced Springs to increase the load capacity, this will allow you to work through the upgraded turret towards the top gun as soon as possible. The 20-pdr Type B gives a great rate of fire, particularly on the second turret, but the low penetration and alpha means you will struggle to make the most of the 2300dpm, particularly in higher tier matches. Once you have the L1A1, the Conqueror really comes alive and feels much more like an end tier heavy tank should. The gun is fast, accurate and deals a respectable amount of damage for a tier 9 tank. After researching the L1A1, you might want to upgrade the suspension to free up an extra equipment slot (if you didn't do suspension first). Then finally grind the top engine, assuming you already researched the Meteor M120 in the Caernarvon. 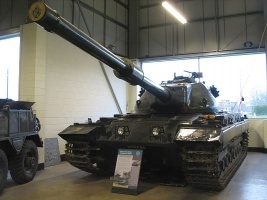 The FV 214 Conqueror was a British heavy tank of the post-war era. It was developed as a response to the Soviet Joseph Stalin IS-3 heavy tanks and carried a larger 120 mm gun compared to the 20-pounder (83.4 mm) gun carried by its peer the Centurion. 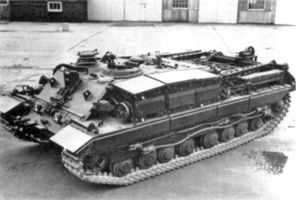 Its role was to provide long range anti-tank support for Centurion tanks. They were issued at nine for each regiment in Germany; usually grouped in three tank troops. -	Design study of Conqueror chassis with limited traverse turret mounting 183mm gun. Wooden mockup produced. -	Mk II - 20 produced. Weight: 57 tons. Winch capacity: 45 tons (direct pull). In the United Kingdom, Conqueror tanks are displayed at the Bovington Tank Museum, and the Land Warfare Hall of the Imperial War Museum Duxford. Other tanks are in the collections of the Musée des Blindés in France, the Royal Museum of the Army in Brussels and the Kubinka Tank Museum, Russia. One is privately owned in the United States as part of the Littlefield Collection. There are also two MkII ARVs at the Military History Museum on the Isle of Wight in an unrestored condition. A MkII ARV is held by theREME Museum of Technology, although it is not on display. 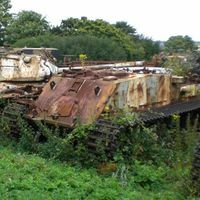 There used to be a Conqueror at Base Vehicle Depot Ludgershall - a gate guardian named "William". Now believed to be at the Isle of Wight Military Museum. A Conqueror was used at the Amphibious Experimental Establishment AXE, at Instow in North Devon UK, for beach tank recovery practise.